The more tight ends that come off the board before pick No. 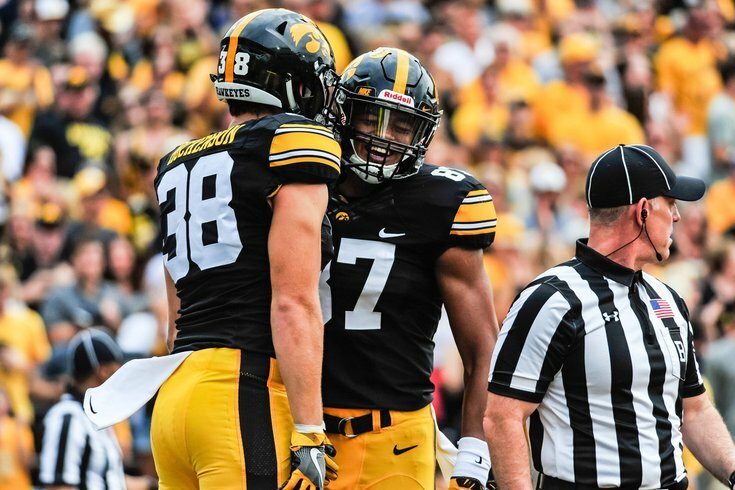 25, like Iowa's T.J. Hockenson and Noah Fant, the better for the Eagles. Leading up to the draft, we'll be taking a look at each of the Philadelphia Eagles' positional groups. We'll determine if the Eagles are likely to select a player at that position with one of their seven picks in the 2019 NFL Draft, as well as note some players who make sense. Today we'll continue on with the tight end position, which is a major strength, and unlikely to be addressed in the draft. The Eagles have a top-3 tight end in Zach Ertz, a very promising young tight end in Dallas Goedert, who doesn't have any obvious holes in his game, and a perfectly cromulent No. 3 tight end in Richard Rodgers. Even Josh Perkins showed a little versatility last year, when he was asked to play wide receiver after the Eagles were decimated with injuries early in the season in 2018. In this year's draft, there are three tight ends who could go in the first round. They are Iowa's T.J. Hockenson and Noah Fant, as well as Alabama's Irv Smith. The more tight ends that get drafted before pick No. 25, the better for the Eagles. In our Grocery Shopping series this year, we did not profile a single tight end. None. Because why would we? However, if I were to throw a dart at a player who could intrigue them either late in the draft or in the undrafted free agency portion of the draft, it would be Donald Parham of Stetson University (of Ray Finkle fame, class of 1980). Parham is 6'8, 243, with 36 1/8” arms and 10 1/2” hands who caught 85 passes in 2018 for 1319 yards and 13 TDs. I love the dramatic music in the following highlight reel, as well as the analysis that pops up on the screen, like, "Not afraid of the middle," lol. Parham could be a project in the same mold as Billy Brown or Ifeanyi Momah.